After catching up with Broakoak's thread where he mentions using a GWR Railcar to haul a van, I'm curious: are there any cases of modern railways using railcars to pull parcels or freight? I know that BR originally planned this with their first generation DMU's, but that it didn't happen very much in practice. The WEG (Württembergiseche Eisenbahn Gruppe) ran mixed (railcar/freight trains up until the late 1980's, in fact the older NE81 units were built with this in mind, but the most recent case I know of where this actually happened was on the Schönbuchbahn near Stuttgart, where their new railcars hauled short rakes of tank wagons up the line to a siding, but I don't think they had any passengers in them at the time (the railcars, that is, not the tank wagons). Anyone know of any more recent examples? Still done occasionally on the Gulflander between Normanton and Croydon in Queensland when the roads become impassable. The line replaced steam locos with rail motors in 1922. A diesel loco was only put on the line in 1988 and is only used as a backup to the rail motors. 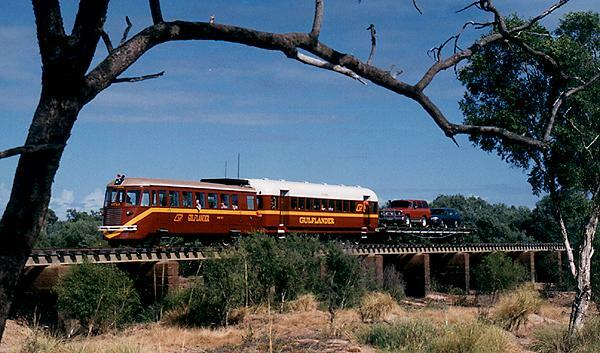 Not so recent, the Commonwealth Railways in Australia would occasionally haul a a single van behind a Budd RDC. The Budd Company did not approve! sometimes get impression in UK, that they don't want to use benefits of rail to move freight/parcels. One idea I came up with a few years ago was to convert the much disliked Pacer 142 etc units into parcels cars, which as single units could be attached to other units. I think that as modellers we should try new ideas like this. Someone out there might just think it is a good idea in reality. Of course not. Otherwise it may become obvious that rail is economically a very good way to transport and then where would the road lobby be? That would make a lot of sense. They could also be routed to malke daily runs up lines like the Wensleydale branch or the Centre of Wales route, with space on board rented to the various parcels companies. Pickup could be on a platform (anyone complaining about security hasn't seen how these vans are loaded/unloaded) and the van could be used for the last few kilometres. Or take it a step further and clice the bodywork off except for the cabs and fit lugs for ISO containers on there. I'm not sure they have the power to haul an extra wagon though, so probably normal drawgear would be a step too far. politicians have been using roads as a carrot to the public, but it is the insurance industry which is the big winner, and would suffer most if there was a big switch back to railways. I think I even have a name for a rail based parcel service - 2Rail-to-You . The Pacer units have their own engines, as far as I know both units, so would have thought one on its on tagged onto another compatible unit would be OK. Agreed. It is similar here, with 1 in 5 people working for the car industry, they tend to call the shots. I've long thought that the change to units in the UK removed a lot of flexibility to carry parcels or small high value freight, or that container flats with pacer-compatible couplings and electric motors could work as well. Not so Andy, the first generation DMUs had ample capacity in the van section for smalls traffic. Newer units were built without van space to increase passenger payload after the decision had been made to ditch the parcels business. This business was sacrificed as part of the "Organising For Quality" which preceded the breaking up of BR for privatisation. With this break up the ability to carry parcels and freight by passenger train went out of the window because passenger and freight were separate businesses and never the two should co-operate... Pretty much the same as local trains are not held to connect with late running main line services any more because the local operator would incur a penalty and/or have to pay compensation if it also ran its trains late. This is why any old BR man would tell you that the national rail network no longer exists and competition between companies is not beneficial for passengers, quite the opposite in fact. Also, as an aside, "Organising For Quality" was commonly known as "O for Q" in the way that trendy with-it management like to use initials to show how trendy and with-it they are. The management always pronounced the "for" very carefully. Lower grades preferred it more as fer than for. Try saying aloud to understand why. Sorry about that: very sloppy English on my part. I ws thinking in terms of the Sprinters (second generation, and as you say, devoid of parcels space) and specifically when they were introduced on the Highland and Far North lines. As you say, the original DMU's had parcels space and could also pull the odd van. I don't know why that changed, but I suspect it was declared 'uneconomical' as that is the standard excuse for stopping something useful that worked. Well it seems there is one railway in Germany running genuine mixed trains, and it is actually within cycling distance of us here, so I may be able to go and visit it. The Schwäbische Albbahn recently started running consists of up to four wood waggons on the back of regular passenger trains, using ex-WEG (Württembergische Eisengbahn Gruppe) NE 81 railcars. wouldn't work here, no profit for evil b's in charge here! Odd thing, doesn't the German government have a hand in running some of OUR railways! The advantage of our system here, is that the villages can call the shots for the services they want, to some extent, and also when the company makes a mistake, the chances are that someone who makes the decisions will be on the affected train, so the companies tend to be more responsive (they're also smaller, which helps too). Of course, there's always the freelance option. I can quite happily run a coach and/or a boxcar behind a railmotor on the FCPyF. Hang about, that's not the FCPyF! It's not even a model. Photo from a Facebook feed I follow. Love it, Bob; already looking forward to seeing the model version. Where does it operate? The only clue is hidden behind the tree in the foreground. I can't find it again, sorry Giles. That's why I copied the image in the first place, there's such a high turnover of posts on FaceBook that stuff soon disappears... It'll be there somewhere but how far down the pages is anyone's guess. I think it's somewhere in S America or Mexico (FC... on the side of the boxcar would support this) but where? Dunno. Not to worry, Bob. I just wondered, that's all. It's such a varied train - modern steel boxcar, coach that must be almost 100 years old (possibly) and what looks like a wooden boxcar converted to a boxcab loco. Just full of character.